ITAME-MASAME. Raised SHINOGI and wide SHINOGI-JI. form in HAMON. HAKIKAKE BOSHI. KUNIKANE(1) KAN-EI 1624 HANGO GENZO. YAMATO. MONJU Group. Work resembles old style YAMATO HOSHO. MASAME HADA. NIE SUGUHA with KUICHIGAI BA and NIJUBA. KANEKURA(2) MEI-REKI: MASAME HADA and SUGUHA HAMON. TOMOSUKE(1) KEI-CHO: SUKE form: JO Help. AMARUMEKIUEMON. for the GAMO Family in KEI-CHO times. WAZAMONO. in EDO and thenafter took the name YASUTOMO. YASUTOMO/TOMOSUKE 3rd Gneration: MARUMEGOZAEMON, same as father. KANETSUGU(2) GEN-ROKU (t: KUNIKANE(4): JIZAEMON. WAZAMONO. KANETSUGU(3) KAN-EN (f: YASUTOMO(5): SANKICHI. 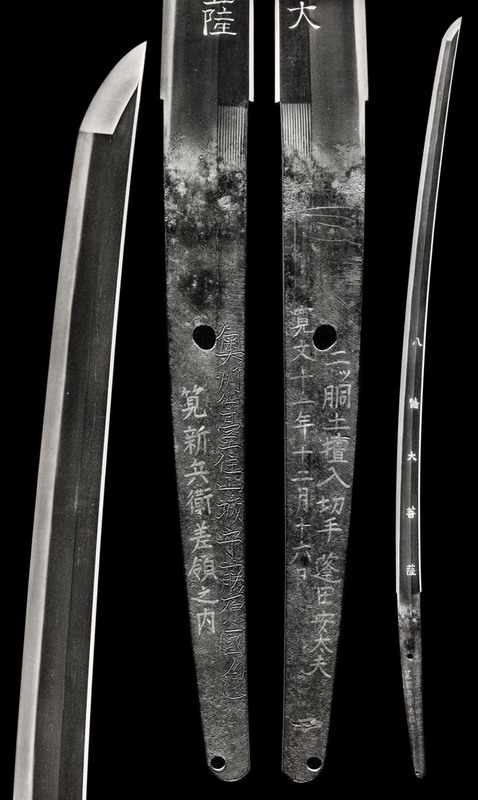 HARUYOSHI GEN-WA: UZEN YONEZAWA JU. KATAKURA. with KAN character of "Hiro". SUGUHA and O-GUNOME-MIDARE BA. HIROCHIKA 2nd HO-EI 1704 TSUDA SUKENAO School. 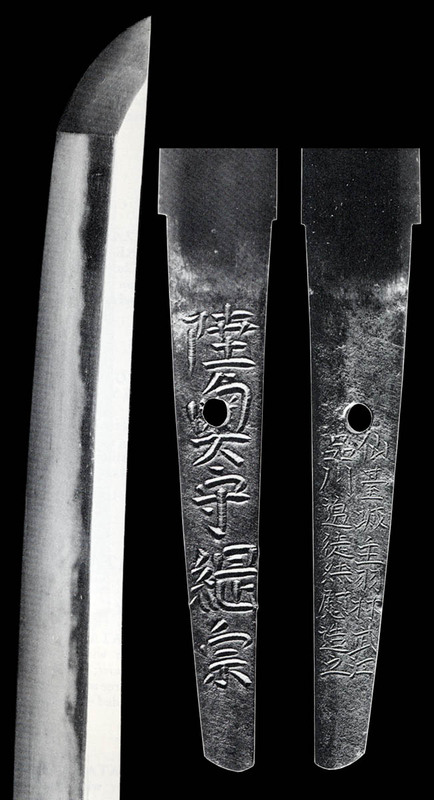 HIROCHIKA 3rd AN-EI 1772 NAKAMURA JU. KATSUSADA(1) MAN-JI 1658 (t: IGAnoKAMI KINMICHI): SADA form: "JO". KATSUSADA(2) KYO-HO 1716: Follows teachings. Standing Masame Hada with Ji-Nie. Chu-Suguha that is Asaki-Notare, wherein Gunome-Midare with Ashi combines with Choji Ashi and Yo. Sunagashi and Kinsuji run through figures. Sugu Komaru Boshi. Ura shows Nijuba. Standing Masame Hada with Ji-Nie and running Chikei. 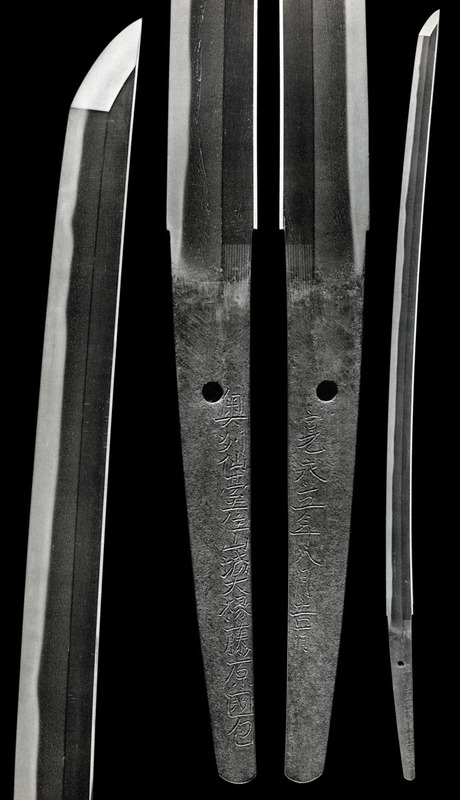 Asaki-Notare of Suguha with Gunome-Midare in strong Nie and clear Nioi. Kuichigai Ba in the Monouchi that runs with Sunagashi. 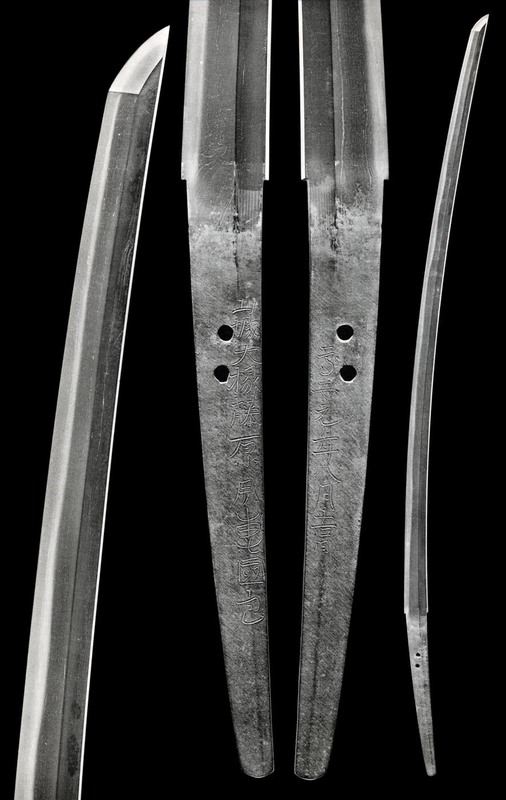 Shinogi-Tsukuri, Ihori-Mune, greatly curved to Chu-Kissaki. Very strongly standing Masame Hada. Chu-Suguha on a gentle Asaki-Notare in Nioi-Fukashi and Nie, with Sunagashi, Kinsuji and Hakikake chasing the grain. Nioi Deki and fine Ko-Nie Chu-Sugu Kuichigao Ba where Kinsuji and Sunagashi create Nijuba. Mune-Yaki spreads toward the Shinogi through Hakikake and Hotsure. O-Suriage Nakago was shortened by Shibata for a service mount before WWII. Inscription includes his Kao. 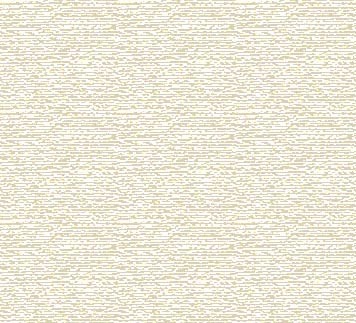 Chu-Suguha with Ko-Gunome and Ko-Ashi in clear Nioi-Fukashi and Ko-Nie. Sunagashi runs with the grain. Chu-Sugu Hakikake Boshi is almost Yakizume. where Nie becomes Ara. Sunagashi runs through figures. Gunome Boshi to Ko-Maru Kaeri. Ubu Nakago has one Mekugi-ana. Shinogi-Tsukuri, Ihori-Mune wide, thick with elongated Chu-Kissaki. Standing Itame Hada runs. Ji-Nie. Ko-Nie Dek Hunome with Choji forms mixed. There are Ashi and Yo. Midare-Komi ko-Maru Boshi has slight Hakikake. Mokume Hada runs with Masame. Ji-Nie. steams throughout the Yakiba. Sugu yakidashi is developed in the lower. Student of Kunikane. Originally from Yamato, his work resembles Yamato Hosho from his Hosho Sadamune school line and the Nanto Monju. Hira-Tsukuri, Ihori-Mune. Suken and Vajra Horimono. A rolling, long O-Notare holds Sugu Kuzure Ba. Hotsure pulls through Sunagashi and Kinsuji throughout the Habuchi. Nie becomes Ara in the lower.